I want to be helpful. I really do. 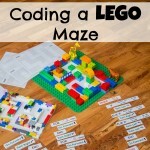 If there is something I can make that would help your child learn more about a topic they are interested in or master a difficult concept, I’m happy to give it a shot (though I can’t promise to be fast). Feel free to contact me. 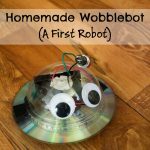 About a month ago, I asked some friends for suggestions on what kind of educational tools I could make based on what their kids were learning. 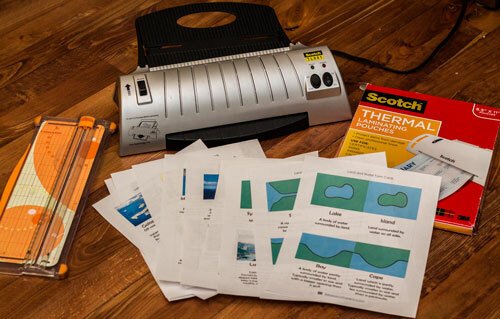 One mom said I should make landform cards. 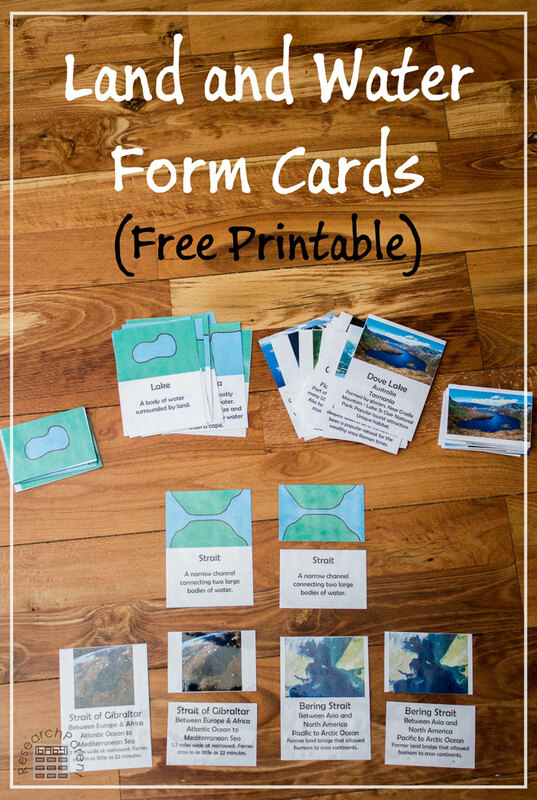 My initial reaction was to point this mom toward several existing, free versions of landform cards. Land and water forms (like island, lake, peninsula, gulf, isthmus, archipelago, etc.) are a common topic of study in Montessori schools. 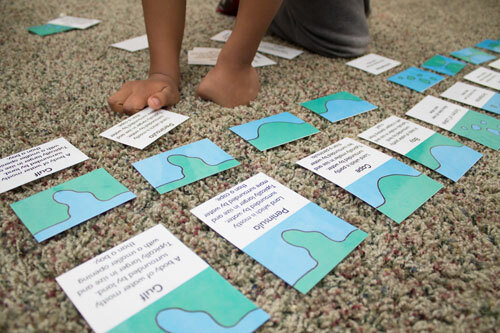 3-part nomenclature style land and water form cards are the typical Montessori way to learn these terms. However, just because a child understands what a strait looks like in cartoon form, does not necessarily mean that they will understand what these terms look like in real life. 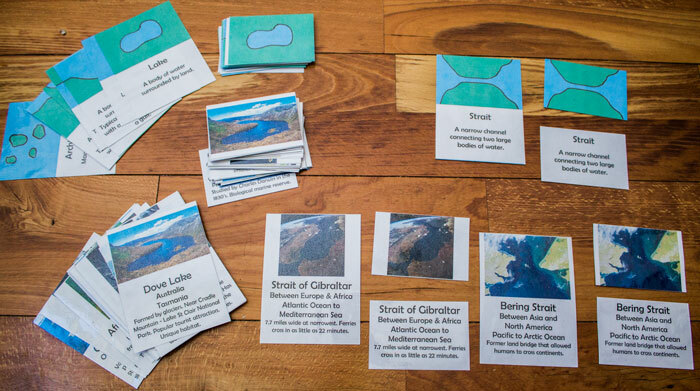 By making cards that show real-life examples (such as the Bering Strait or Strait of Gibraltar) in addition to the definition card, children not only get an extra chance to learn what these terms mean, but they might pick up a little geography as well. Since many of these locations are historically important, I’m hoping that by helping kids become familiar with them, future learning might be more memorable since they will have a point of reference. When my son was in a Montessori preschool last year, I was mildly embarrassed one day when his teacher informed me that my 5 year old did not know what an island was. Apparently in all his years of life, it had just never come up. Thankfully, his school took care of this gap in his knowledge. The way they taught about terms like lake and island with the younger kids was by making play dough recreations of these land and water forms. 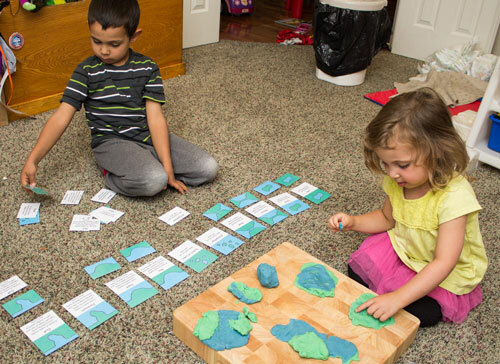 This seemed like such a good idea, we used our homemade play dough to make each of the 10 terms featured in this set of cards. 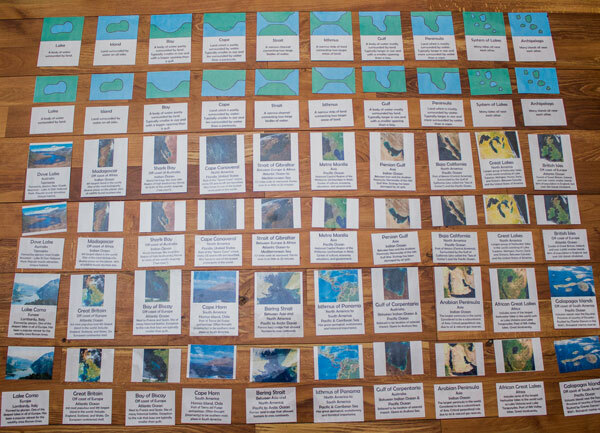 Then I had my son match up just the standard cartoon definition cards using the control cards for reference. However, as expected, he still had trouble keeping all the terms straight. The next day we went to our homemade wall map and placed a few of the picture cards on the appropriate continents on our map. This gave us a chance to review the different continents and talk about what each of the picture cards depicted. We didn’t do all 20 picture cards at once. Instead, for the first day we did island, lake, strait, and isthmus. I would show my son one of the picture cards and have him guess which of those 4 terms it was showing. He loved this game. 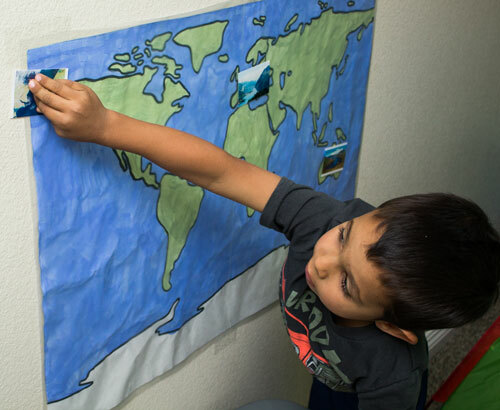 He and his 3 year old sister also loved taping the pictures to the map where they belonged. Neither of my kids know all 10 terms yet, but they’re well on their way and they had fun learning, which is what is most important to me. I definitely recommend providing some hands-on experience making these landforms. To do this, use your homemade play dough recipe of choice or buy some blue and green Play-Doh. 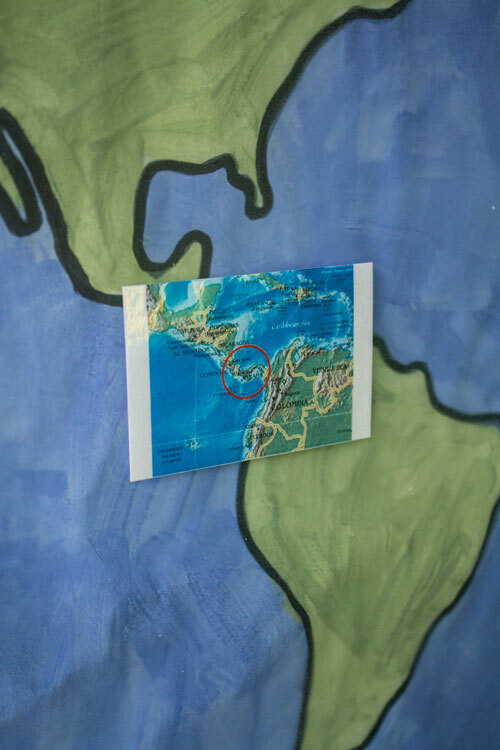 If you’d like to do the map activity, feel free to use any large world map or download my free printable template for a homemade learning world map. These are great! 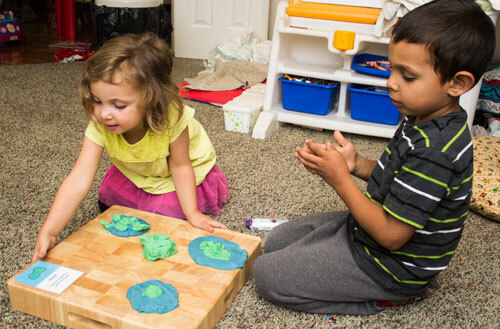 I love the idea of using homemade play dough with them. I’m so glad you can use them, Rebecca! I loved your hair art project. We are definitely going to try it out soon. Even my 3 year old would love it. 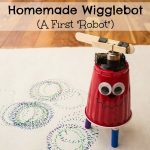 Thank you for stopping by the Thoughtful Spot Weekly Blog Hop and sharing your fun science printables with all of us! Have a wonderful weekend and I hope to see you on Monday again! Thanks so much for this great resource. Love the real photos and can’t wait to make/use the cards. May I just suggest changing the wording for the British Isles description? The entire island of Ireland is not actually part of the British Isles. Northern Ireland is (6 counties to the north) but the Republic of Ireland (26 counties in the south) is not. A small detail, but a big deal to some! Thanks for the great info! I can see why that would be an important distinction! I’m on vacation, but I would be happy to fix it when I get home. I’ll update it by Monday. I ended up removing the word Ireland entirely from the definition of the British Isles. According to Wikipedia, it seems that most people mean the entire island of Ireland when they are talking about the British Isles despite the word British in the name. The Republic of Ireland doesn’t recognize the term. Thanks Michelle, it has been a grey area for a long time! A new generation of learners can maybe benefit from some clarification. And thanks again for sharing the resource, I love it. Dear, I really loved it. This is what i was searching for! World of thanks for sharing this tremendous and fruitful activity.